This is a forex tip trading secret that relatives found after WD Gann's passing. He left in his trading room a square of nine chart whereby he would locate support and resistance levels for trading the stock market and commodity market. For those unfamiliar with the square of nine chart it is a chart with numbers starting with number one in the center, number two on the left, number three on top of number two, number four on the right of number three, number five on the right of number four, number six below number five, number seven under number six, number eight to the left of number eight and finally number nine to the left of number eight. These numbers in a square (1-9) are what is know as the foundation of the square of nine. All other numbers keep being added around this initial square in similar sequence as the first nine. Once the numbers are built up natural support and resistance levels show for any mathematical formula. It is just a matter of reading the chart horizontally, vertically or diagonally. WD Gann was not the inventor or founder of this system. He obtained it from the Middle Eastern Culture and Ancient Indians. However, he has been credited as being the first to master and use the numbers with his trading. These powerful number sequences are said to work on a universal basis, in the structure of maths. Enough of the background, lets look at last weeks (June 2010) day trading results in the AUD/USD. On the chart below we see how price action held between 86c and 88.5c. [The natural square levels]. When I placed these two trades I anticipated price to have a difficult time passing these levels. When Gann day traded he had expectations of where price action would stop. It is believed he relied heavily on his square of nine chart showing these natural square numbers. Last week when I day traded the Australian dollar, I anticipated these natural square numbers and nailed the market. (Credit to William Gann). 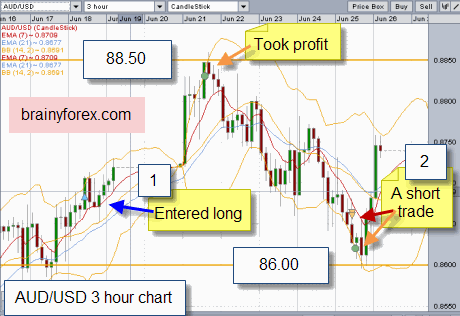 The above chart shows the two trades where the circles show where profit targets were placed. 20 pips under the natural square level for the first trade (long trade) and 20 pips above the natural square level on the second trade (short trade). Notice that 96, 91, 86 and 81 are the horizontal and vertical levels on the square of nine chart, whereby a 50% division works well for 93.5, 88.5, 83.5. For traders trading shorter time frames, further 50% divisions can be made yet further. For more forex tip trading suggestions go here.